Herbs, shrubs, and trees are three types of plants categorized based on the size and the branching pattern of each plant. The main difference between herbs, shrubs and trees is that herbs have soft, non-lignified, unbranched stems while shrubs have woody, immediately branched, multi stems and trees have woody stems that grow upright for about a meter before branching. Since shrubs and trees are somewhat similar to each other, they are always lumped together. 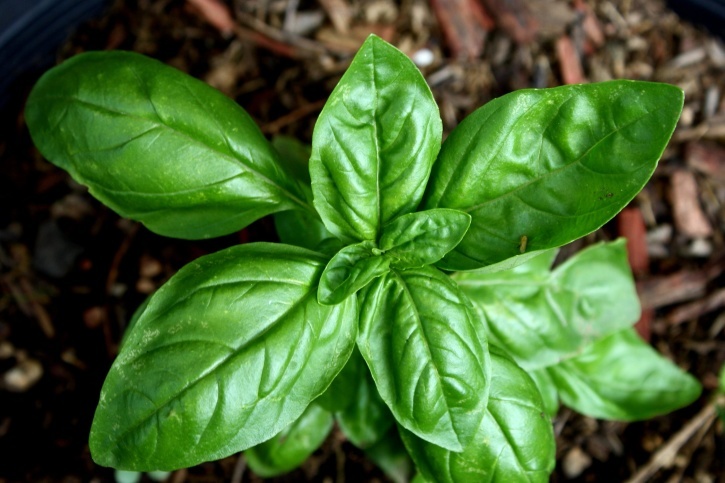 Banana, basil, tulsi, lettuce, and coriander are examples of herbs. Shrubs are taller than herbs. Rose and lemon are examples of shrubs. Trees are the tallest plants. Mango, coconut, and Banyan are examples of trees. Herbs are seed-producing, non-woody plants. They die at the end of a growing season. Parts of herbs are valued for its medicinal and aromatic qualities. Herbs contain an unbranched stem. The three types of herbs are biennials, perennials, and annual herbs. Biennial herbs take two years to complete their lifecycle. Perennial herbs live more than two years. Annual herbs complete their lifecycle within one year. Culinary herbs are used in small amounts to provide flavor to food. Perennials like lavender or thyme, biennials like parsley, and annuals like basil are used as culinary herbs. Shrubs are woody plants that contain several main stems arising near the ground. The height of a shrub is less than 13 feet, and the diameter of the stem is around 3 inches in diameter. Shrubbery refers to an area of a garden cultivated by shrubs. 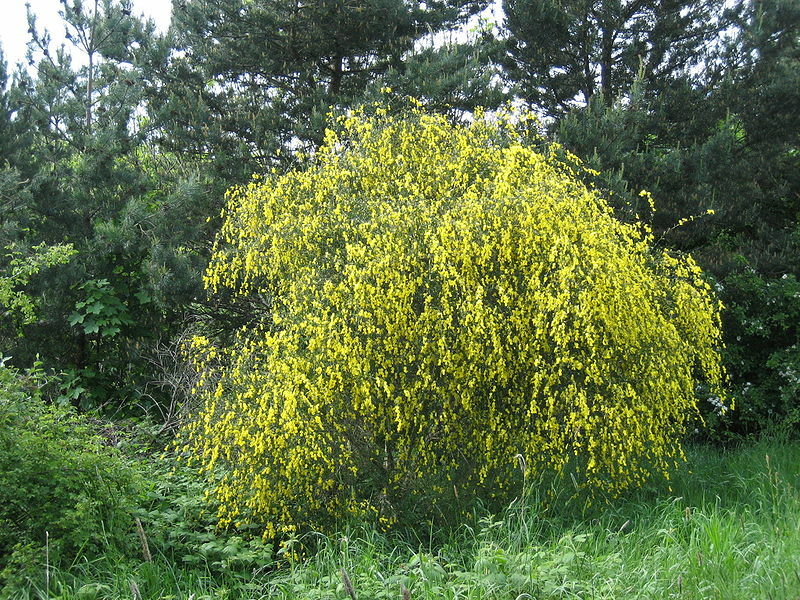 A flowering shrub is shown in figure 2. Witch hazel, roses, forsythia, lilacs, holly, rose of Sharon, Fothergilla, Stewartstonian azalea, oakleaf hydrangea, red twig dogwood, King’s Gold and Gold Mops, and hibiscus are some examples of shrubs. Trees are woody, perennials with a single trunk, growing to a considerable height. The lateral branches of a tree occur at some distance from the ground. The height of a tree should be at least 13 feet. The diameter of a tree should be at least 3 inches. The branching occurs at a point of 4 ½ feet above the ground. 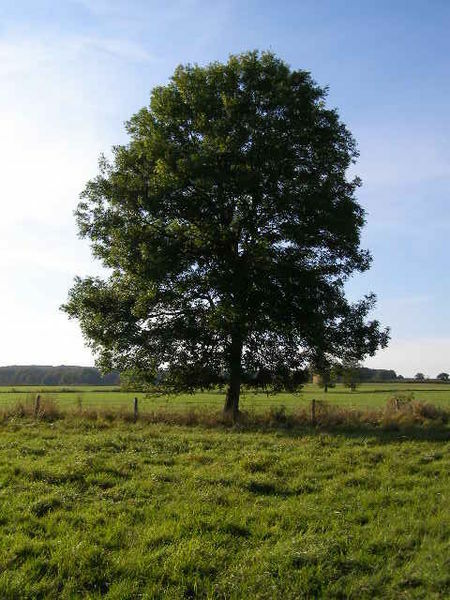 An ash tree is shown in figure 3. The majority of trees are angiosperms, and the rest are gymnosperms. The woody growth occurs due to the action of the vascular cambium. The bark of a tree is formed by the cork cambium. The trunk grows as annual rings in angiosperms. They can be used as timber. All herbs, Shrubs, and trees belong to the kingdom of Plantae. The body of all herbs, shrubs, and trees are differentiated into stem, root, and leaves. All herbs, shrubs, and trees are vascular plants. All herbs, shrubs, and trees are flowering plants that produce seeds. Herbs: Herbs are seed-producing, annual, non-woody plants. Shrubs: Shrubs are woody plants that contain several main stems arising near the ground. Trees: Trees are woody, perennials with a single trunk, growing to a considerable height. Herbs: Herbs have non-woody, soft stems. Shrubs: Shrubs have woody stems. These stems are thick but not hard. Trees: Trees have woody stems. These stems are thick, hard, and brown in color. Herbs: The stems of herbs do not have branches. Shrubs: Shrubs have branches at their bases. Trees: Trees have branches in a single stem. Shrubs: Shrubs are taller than herbs. Trees: Trees are the tallest among all the plants. Herbs: Herbs can be annual, biennial or perennials. Shrubs: Shrubs are mainly perennials. Herbs: Herbs add flavor to food and provide medicines. Shrubs: Shrubs have a medicinal value, and can be used in gardening. Trees: Trees prevent soil erosion, maintain the carbon dioxide content in the air, and provide wood. Herbs, shrubs, and trees are three types of plants that grow on the earth. Herbs are the smallest, non-woody plants, which lack branches. Shrubs are taller than herbs and contain branches at their bases. Trees are the tallest plants with branches above the ground level. 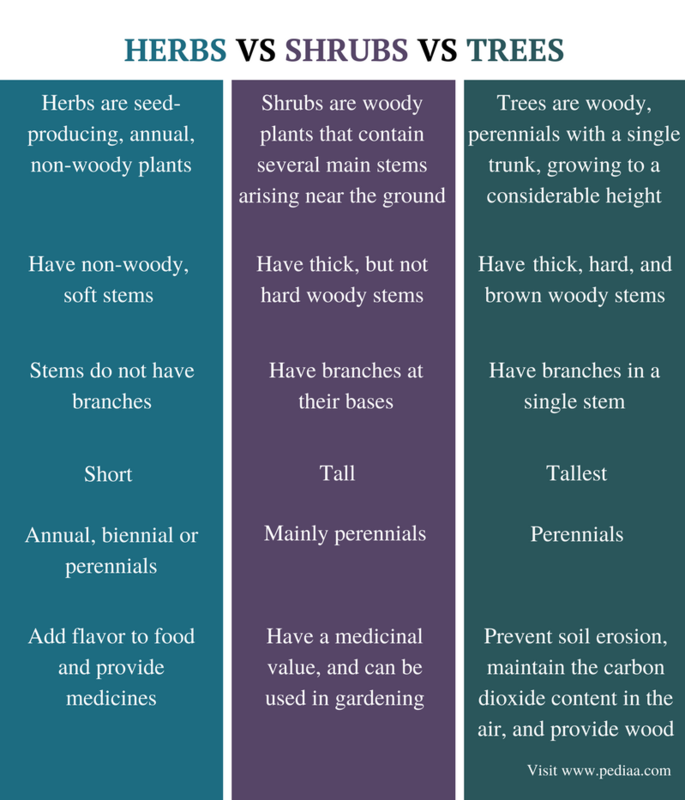 The main difference between herbs, shrubs, and trees is the type of stems in each type of plants. 1. “What are Herbs?” Harmonic Arts Botanical Dispensary, 11 Mar. 2016, Available here. 2. “Shrub.” Encyclopædia Britannica, Encyclopædia Britannica, inc., 1 May 2014, Available here. 3. “Extension Forestry.” What Is A Tree?, Available here.